It is a join-in cherry blossoms viewing tour in Tokyo with an English-speaking assistant. Meet at the Tokyo Station in the morning and visit four famous viewing spots in Tokyo including Imperial palace, Asukayama park, Sky tree, and Shiba park with tempura lunch. 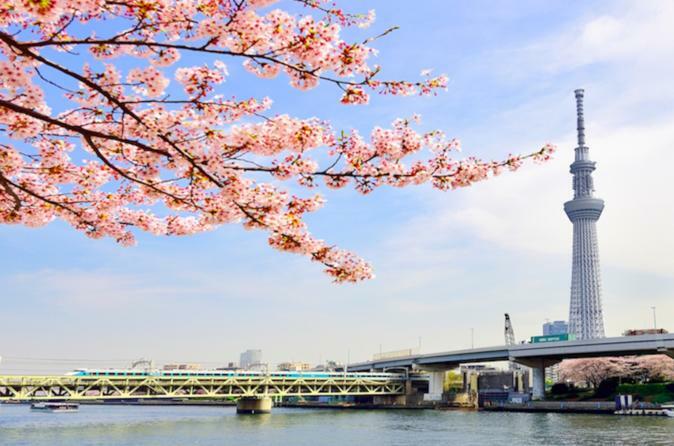 A tour assistant will take you to all the famous cherry blossom places in Tokyo. Located in the former sit of the Edo castle, it is the residence of Japan's Imperial Family. It is one of the best places to see cherry blossom trees in the spring, you could say it is the symbol of our country as well. Three hundred years ago, this park was born as a cherry blossom viewing place for the commoners of the Edo period. Beyond the era, in spring it is still a famous place where many people visit to go cherry-blossom viewing. It is a popular area where they hold many events such as fireworks, however in the spring it is very famous for the cherry blossoms since it stretches for a long distance making it a great place for a stroll. A television broadcast tower in Japan and the tallest building in Japan with a height of 634 meters (634 which in Japanese can be read as "Musashi", a historic name in Tokyo). There are variety of restaurants near the tower, you will be having lunch here. The oldest public park in Japan, the beauty of the cherry blossom and the Tokyo tower makes it look like its from a painting. The Tokyo tower was built in 1958 a monument that symbolize economic growth after the post war boom. The tower is now mainly use for tourism and antenna leasing. Come join this tour and enjoy the cherry blossom season just like the Japanese people. Take pictures and make memories that you will never forget with this tour.